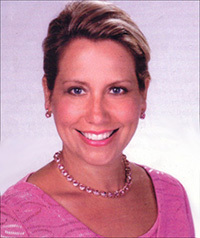 When Beth Testa opened the Pink Poodle in October, 2002, she brought a lifetime of shopping and reselling experience to her business. Her retail experience at choosing the quality merchandise that will sell makes the Pink Poodle a fun and unique shopping experience. The Pink Poodle is on Odana Road, between Westgate and West Towne Malls. Look for designer hand bags priced at about a third of the original cost. You'll find gold jewelry, furs, estate jewelry, clothing, shoes furniture and home accessories. Famous labels like Chanel, Gucci, Ferragamo, Calvin Klein, Doncaster and more appear at bargain prices. An exclusive St. John rack features the famous knitwear at prices far below even sale prices. It's worth a trip to the Odana Road boutique to see Halle, the champion Standard Poodle who comes to work every day. Between Halle's pink toe nails and the signature glitz and glamorous attire of owner Testa, you know this is the place for fun, frivolous and fascinating accessories as well as to-die-for bargains. Although most of the merchandise is consigned, Testa shops major markets and makes frequent buying trips to New York to keep new, cutting edge items available for shoppers. The formal and party wear items are great buys, considering you may only wear the garment once. Mothers of brides and grooms can outfit themselves for a fraction of the price of a gown selected new. Check out the watches — you'll want one for each day of the week. And at Pink Poodle prices, you can afford it. In our new store, we have expanded the consignment mix to include menswear (sportswear and golf attire) as well as furniture and home accessories. In addition to its phenomenal racks of clothing, The Pink Poodle is noted for its funky, bling-filled atmosphere offset with gold and leopard-skin accents, and the best dressed employees offering exceptional customer service. Enjoy an experience with us!